We’re committed to service excellence… one customer at a time! If you’re considering leasing a new vehicle, the process can seem overwhelming. We’ve assembled a list of vehicle leasing term definitions to help you navigate all the jargon, contracts and negotiating. Learn the ins and outs of lease agreements before you start searching for the perfect vehicle. Acquisition Fee – a service charge for processing a lease. Capitalization cost – the total price of the vehicle, which the lessor uses to calculate the amount that the customer will be paying. This is equivalent to the purchase price of a vehicle that’s sold. Cap Cost Reduction – equivalent to a down payment on a purchased vehicle, this is the amount that you pay when signing the lease, in addition to any separate fees that are assessed. When you pay a larger sum initially, monthly payments will be lower. A smaller cap cost reduction means a higher monthly payment. The value of your trade-in can be applied as part of this amount. Closed-End Lease – a lease that fixed the vehicle’s residual value initially, stating it in the contract. Most vehicle leases are closed-end, which means the customer won’t owe an additional sum at the end of the term if the car turns out to be worth less than anticipated. Dealer Participation – an amount that the dealer contributes to lower the total price of the vehicle, in an attempt to secure the customer’s business. Any dealer contribution is applied to the cap cost reduction. Depreciation – the amount by which a vehicle loses its value over a specified period of time, which is the difference between its original price and its residual value later. No specific figure for depreciation appears in lease contracts, but it’s taken into account in setting residual values. Disposition Fee – an amount to be paid at the end of the lease term, to cover costs of preparing the returned vehicle for sale. Early Termination Fee – a penalty assessed if you choose to end the contract earlier. Lessors justify this because depreciation is highest in the early portion of a vehicle’s life, so a prematurely terminated lease cuts heavily into their earnings. End-of-Lease Purchase Price – an agreed-upon price that you will pay when the lease is up, if you choose to keep the vehicle. Excess Kilometer Charge – a per kilometer amount charged if you drive the vehicle more than the stated maximum, if you expect to drive farther than the contract allows, you can usually negotiate a lower figure for the excess kilometers. Excess Wear and Tear – If the vehicle is returned in good condition, there should be no extra charge. A certain amount of wear-and-tear is permitted, but significant body damage or evidence of improper maintenance will trigger additional sums to be paid for necessary repairs. Gap Insurance – In most cases, your regular auto insurance covers the leased vehicle. If the vehicle is totally wrecked, however, it could be worth less than an insurer will pay. Gap insurance covers the difference between the cash value of the vehicle and what you still owe on the lease contract. Lease Term – a period of months during which you have use of the vehicle and will pay an agreed-upon monthly payment. Lease terms of 24 or 36 months are most common, but 12-month leases or 60 month contracts can be obtained. Lessee – the person who leases a vehicle from a dealer or other organization. Lessor – the dealer or other organization that leases a vehicle to a customer. Monthly Payment: Amount that you are required to pay to the lessor or its agent every month, through the lease term. Purchase Option – the right to buy the vehicle that you’ve leased, at the end of the lease term, for a stated price. Residual Value – a prediction of what a vehicle is likely to be worth as it ages, usually expressed as a percentage of its original price. Residual values may be supplied for vehicles that are 24, 36, or 48 months old. Security Deposit – a deposit, usually refundable, required before the lease contract takes effect. Subvented Lease – a lease with favorable terms, due to a manufacturer’s decision to absorb a portion of the cost. The manufacturer “subsidizes” part of the total price, by use of a special incentive – a low interest rate, higher-than-normal residual value, or a discount provided by the manufacturer. 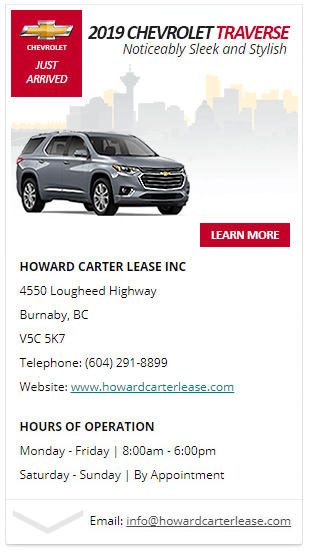 "We had been looking at a few different trucks over the month and ended up at Howard Carter Lease. The Salesman demonstrated detailed and concise product knowledge while I browsed. Which resulted in test driving the formidable 2017 GM Colorado.